Hi friends! I hope you're having a great day! I'm still here. Hoping to have this baby before Christmas. It's looking bleak though. :/ That's ok. It will happen when it happens. Today, I'm sharing a present I made for a friend with you. 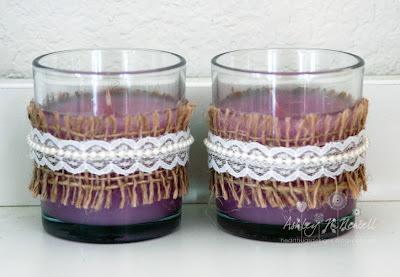 I started with some inexpensive Glade candles. I like these kinds of candle. I can't justify paying $20 for Yankee candles. I'm sure they are fabulous but I'm cheap. 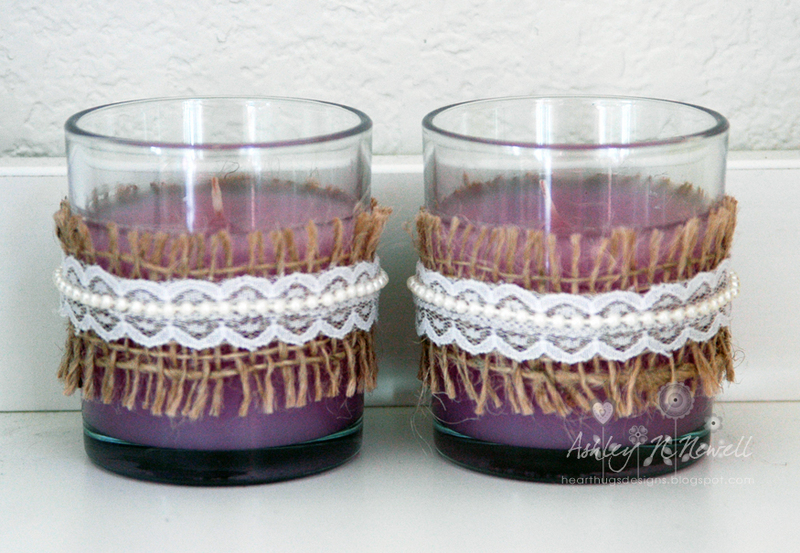 ;) I used some OLD May Arts burlap and some newer May Arts pearl lace to decorate these. It was a pretty quick project but I really think it elevates these simple little candles. Great gift! I hate spending money on candles too! :> I hope you have the baby after Christmas because I don't want you to have the baby on Christmas! Plus having a birthday after is better! :> Can't wait for you to have baby so I can see pictures!